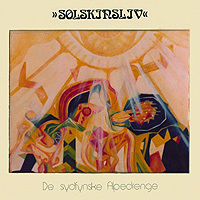 This is an Old Danish band the existed between 1973 and 1975 but never released any records. Orpheus has released a real gem. Despite most bands of this time, these guys sung in English and not Danish. Most of the tracks are based on acoustic guitar with bass and drums but the tracks are mixed up and sound unique and different by the use of flute, violin, congas, jew’s harp and piano here and there. These guys really had a great folk rock sound and wrote excellent songs. I am most impressed with the record and highly recommend it! Vinyl only.. 500 copies.